Few pleasures are more enjoyable for a writer than seeing one’s words in paid-for print. 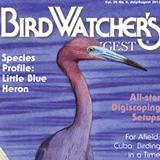 My article, “The Way to See a Life Bird,” came out this month in my favorite birding magazine, Bird Watcher’s Digest. It’s so lovely to look at the magazine rack at Barnes & Noble or at my local library and see the magazine there with my article in it! My article discusses the decisions one makes about whether a bird seen for the first time qualifies to go onto the Life List, a topic that birders can debate hotly. A birder’s list is a personal thing, however. I wrote about my own rules, how I broke one once with a barely seen Varied Thrush, and how I redeemed myself with a glorious sighting of a Varied Thrush in full sun, singing his heart out.That’s the way to s ee a life bird! This is the fourth piece of mine BWD has published and each time it’s been a treat. They choose good photos to accompany the article and seldom make changes to my writing, so I have a lot to be thankful for. The magazine is still published by the family that founded it, all birders themselves, so over the years I’ve enjoyed reading about growing kids and family successes. Now I just have to come up with a topic for article five….